This month’s quote is commonly attributed to both Agatha Christie and Mark Twain, but its origin is likely an anonymous speaker before both Twain and Christie's times. The world of philanthropy is changing. From shifting donor demographics to the rollout of Salesforce.org Philanthropy Cloud, United Ways have to work hard to keep on top of changing trends and evolving donor expectations. As United Way workplace campaigns across the country continue their slow decline, it’s obvious that something has to change. If we keep doing what we’ve always done, we cannot expect the world to suddenly change for us; we must adapt to the world. In the face of a necessary change, the next step is intimidating. Venturing into a world unknown is challenging, yet it is essential our continued evolution and existence. To stay ahead of the national pattern of decline, United Ways need to start transforming. We know organizational change is scary, and that’s why we provide a guiding hand to United Ways across the country. Learn how our Introduction to an Issue Focus Board Retreat can get your United Way started on the journey to become a more relevant, sustainable, and impactful organization that is ahead of the workplace campaign decline. 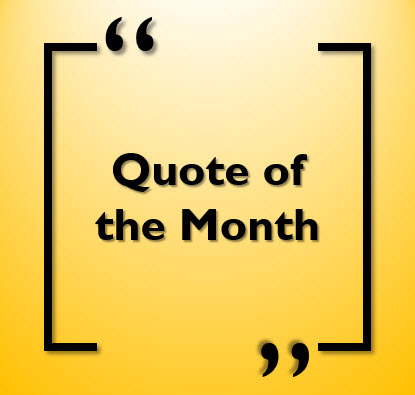 If you have a quote you would like to share for our Quote of the Month, please let me know at sarah@perspectives4uw.com.